Born at a time where women in Ghana were synonymous with managing homes and specialising in dress-making, Akua has defied insurmountable odds to become a national icon. She studied law at the University of Ghana and Oxford University. She became a Judge of the International Criminal Court (ICC) at The Hague until March 2015 when her mandate of 12 years ended. Professor Kuenyehia was the First Vice-President of the Court for the first six years of her mandate from 2003 to 2009. Then she was a judge of the appeals division for the rest of her term. She was also one of only three female African judges at the ICC. 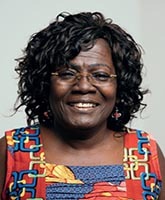 She represented Ghana on the United Nations’ Convention on the Elimination of All Forms of Discrimination against Women (CEDAW) Committee in 2003. She has inspired young African women the world over with her model of education, empowerment and equality. Nominated by John Boadu from the CPE Part Time Year 2 and chosen for the Inspired by Law gallery of lawyers and legal campaigners in 2015. Photo kindly provided by Professor Akua Kuenyehia.